Yesterday Cairo, today Tokyo, tomorrow Moscow, always with an updated time zone. 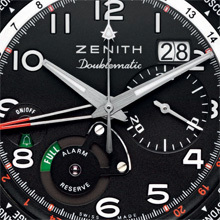 A simple operation sends the Pilot Doublematic’s worldtime function through all the time zones, as the crow flies. Pilot Doublematic’s hands travel around the globe. Vast though the world may be, this watch’s mechanical heart has a perfect command of world time. Its ease of use makes it an everyday instrument that will faithfully accompany globetrotters in their wanderings. One disc transferred onto the flange reveals the time in each iconic city, while a second disc indicates day or night. 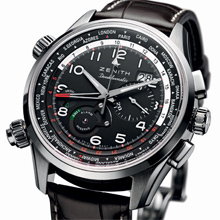 Paired with a chronograph, the Pilot Doublematic watch has two barrels, one of which is devoted to measuring time and the other to an alarm function. The alarm is activated and set by a pushpiece button and crown at 8 o’clock. On the dial, a pierced ruthenium black and red hand shows the time set for the alarm, while an opening at 8:30 confirms that it is turned on. An alarm reserve indicator at 7 o’clock tracks the status of the barrel. 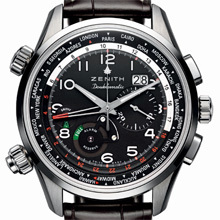 The 30-minute chronograph counter is at 3 o’clock, and is topped by a large date. The sweep seconds hand is accentuated by a Superluminova arrow, while the athletic design of the hour and minute hands dates them as being squarely 21st-century. The chapter ring is set off by luminous numerals that seem to levitate above the silver or sandblasted matt black dial. Readability is excellent. Housed in a 45-mm brushed and polished steel or pink gold case, the mechanical selfwinding El Primero 4046 movement shows its skeletonised rotor ends through the sapphire caseback. This 439-piece watch operates at a frequency of 36,000 vibrations per hour and has an ample 50-hour power reserve.